Trinity Players is proud to announce that its oustanding production of 'Wind In The Willows' has won the award for Best Drama at the prestigious NODA awards. Testament to the hard work, vision and dedication of its production team, cast and crew the show was a tremendous success and was loved by its audiences. Congratulations to all who made 'Wind In The Willows' another fantastic, award-winning production. Trinity Players is very proud to announce it has been awarded the NODA Regional Production Award For Best Musical 2015 for its tremendously successful production of Hairspray. Hairspray was a huge show with a cast in excess of 40 and over 25 song and dance numbers for the cast and production team to choreograph, learn and perform. The show was a huge success, receiving a standing ovation after every performance and even having the audience up out of their seats singing and dancing along with the show. It was a magical moment of musical theatre of which the society is extremely proud and is very honoured to receive this prestigious award. As Trinity Players makes the final preparations for its forthcoming production of Hairspray arrangements are well under way to celebrate the 40th anniversary of this award-winning society. During this time Trinity Players has produced around 114 shows (See Past Shows page) and has won many prestigious awards. (See About Us page). To celebrate its successful 40-year history Trinity Players is holding a dinner dance which will take place on 6th June 2015 and is open to people who have directly supported the society over the years, either as members, crew, patrons etc. If you are a current member, past member, patron or other associate of Trinity Players we would like to extend a warm invitation to you to join us at this event and celebrate the tremendous history and achievements of Trinity Players. Entry is by ticket only and there are limited places available so to find out more and to book your ticket please contact us at info@trinityplayers.com and include brief details of how you have supported Trinity Players. Tickets cost £35 and the closing date for applications and payment is 16th May 2015. Trinity Players is proud to announce that The Ladykillers, directed by Helen England and performed at Sutton Arts Theatre in September 2014 was nominated and came runner up for the award of Best Drama at the NODA awards. Congratulations to Helen and the cast and crew for this recognition of a fantastic production. Trinity Players is proud to announce that its Musical Director, Tim Harding, has once again won BFAME's 'Roy Marshall Cup for Best Musical Achievement', this time for The Sound Of Music, which was performed in May 2014 at Sutton Coldfield Town Hall. To receive the award once is a fantastic achievement but to retain it for a second year is outstanding and is a credit to the tremendous hard work and enthusiasm that Tim puts into any show. Congratulations to Tim and everyone else that made 'The Sound of Music' such a fantastic, award-winning production. Trinity Players has a back catalogue of firsts and its latest musical is one more notch on the success post. 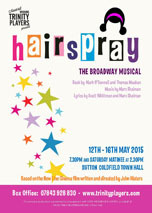 TP is excited to announce that its musical for 2015 will be 'Hairspray', making TP's production the amateur theatre society premier production of this fantastic musical. 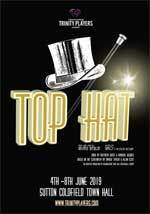 The show requires a large cast, therefore TP will be looking for young people to join in the fun. Auditions will be taking place in January 2015 so if you would like to be a part of this amazing show please contact Trinity Players (See Contact Us page). 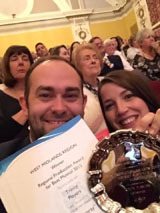 Trinity Players has done it again winning the prestigious NODA Best Drama award for the second year in a row for its 2013 production of 'Open All Hours'. Performed in September 2013 at Sutton Arts Theatre the show was the first official stage adaptation of the hugely popular television series that starred Ronnie Barker and Sir David Jason. The stage adaptation was co-written by Director Jane Aston and Gary Simmons, who stepped away from Directing to take on the lead role of Arkwright. After gaining permission from the writer of the original TV series, Roy Clarke OBE, Jane and Gary researched the show at great length to ensure the stage adaptation captured the true spirit of the television series. It was perfect timing too, coinciding with the 40th anniversary of the television show. With this in mind along with the huge success of the TP production and the support of the original cast and crew, Jane and Gary decided to set up Open All Hours Productions and embark on a UK tour with the show, offering many more audiences the chance to enjoy this superb piece of well-crafted theatre. Trinity Players has once again been rewarded for its high quality productions, with the latest award being given by the Birmingham Festival of Acting and Musical Entertainment (BFAME) at its prestigious annual awards ceremony, which was held on 22nd February 2014. 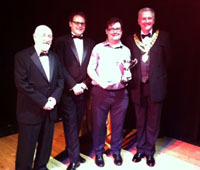 Trinity Players is proud to announce that its current Musical Director and Director, Tim Harding, won the 'Roy Marshall Cup for Best Musical Achievement' for Hello Dolly, which was performed in May 2013 at Sutton Coldfield Town Hall. Everyone at Trinity Players is thrilled with this result, a testament to the hard work and dedication that Tim has given to the society. Congratulations go to Tim and everyone else that made 'Hello Dolly' such a fantastic, award-winning production. Trinity Players is to perform a first in the form of a production composed of a selection of comedy radio plays. The production promises an evening of entertainment and laughter along with an included supper. Help TP to make this event a success by booking your place now on 07817 129656. Following hot on the heels of its highly successful production of 'Open All Hours' Trinity Players' next production, 'Songs of the Musicals', sold out three weeks before it started. This is a huge achievement and is testament to all the hard work put in by every member of the society. Trinity Players continues to go from strength to strength gaining new members and performing a wide range of shows. The latest musical event saw members of Trinity Players performing songs from a wide range of musicals including Mary Poppins, Les Miserables, Miss Saigon, Phantom Of The Opera, Singing In The Rain, Wicked, We Will Rock You and many more including songs from our next show 'The Sound Of Music'. Latest Show Is A Sell Out! 'Open All Hours', written by Roy Clarke and adapted for stage by Trinity Players' Directors Jane Aston and Gary Simmons, is a hilarious comedy presenting the daily goings on at Arkwrights Grocery store. It follows the exploits of Arkwright and his long-suffering nephew and errand boy/Deputy Assistant Manager, Granville. The show, which opened at Sutton Arts Theatre on Friday 13th September 2013, achieved a tremendous rate of ticket sales with all nights being sold out a week before opening. This demand for seats is unprecedented in the near 40-year history of the society and Trinity Players is thrilled that its show has received so much interest. The show ran with 9 performances (including a Saturday matinee) from 13th-21st September 2013 and audiences every night came out saying how much they had enjoyed the show and how accurately each of the characters had been portrayed. A truly classic British comedy which has proved to be one of if not the most successful play ever produced by the society. At the 2013 BFAME awards Trinity Players were nominated for six categories and won two. Congratulations go to Rob Thomas for winning 'Outstanding Male Performance in a Musical' and to the cast of Blood Brothers for winning the award for 'Outstanding Achievement for Full Length Drama'. Trinity Players continued its run of awards at the 2013 NODA awards by winning 'Best Drama in the Birmingham West District' for Blood Brothers.